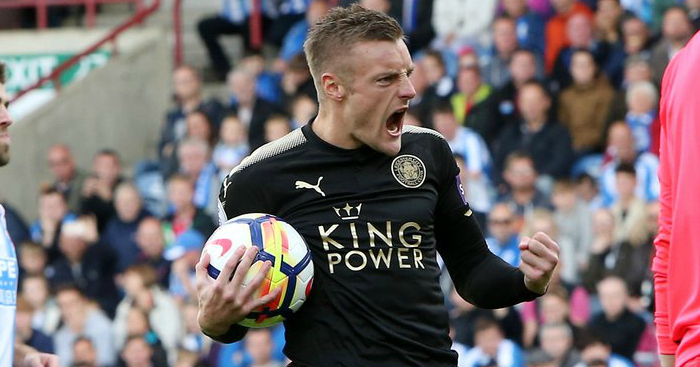 A tight game was played out at the John Smith’s Stadium where the Terriers and Foxes drew 1-1 – Jamie Vardy’s penalty cancelling out Laurent Depoitre’s opening goal in the 46th minute. The last time Leicester visited West Yorkshire to face the Terriers was back in the Sky Bet Championship, when they lifted the league title on the final day of the season. Depoitre who scored on his Premier League debut, got his goal in the 46th minute of the game, he replaced the injured Steve Mounie up front. The Belgium born striker swivelled past Leicester centre back Harry Maguire and then beat the former Hull man for pace to slot it past Kasper Schmeichel in the foxes goal. The former Premier League champions then won a penalty just minutes later as Andy King was fouled in the area by Town left back Chris Lowe. Vardy smashed the spot kick past Jonas Lossl Town’s on loan goalkeeper to level up the score. Vardy has had a hand in 15 goals (12 goals, three assists) in 18 Premier League appearances under Craig Shakespeare. Since their return to the top-flight in 2014/15, the Foxes have won 25 penalties, scoring 19 of them, only Manchester City (26 taken, 20 scored) can better them on both counts. Then Huddersfield could have taken the lead when Elias Kachunga headed the ball into the back of the net from close range. However he was ruled offside by the finest of margins to deny Town the win. The result goes someway to Town getting back on track after the disappointing defeat to West Ham on Monday night. The draw keeps them sixth in the league standings, while Leicester move up to fourteenth. It is the Carabao Cup next up for both these sides, Huddersfield head to Crystal Palace, a team who they beat 3-0 on the opening day. While the foxes host Liverpool, and then welcom them again in the league days later. Town head to Burnley for their next taste of Premier League action.